One of my favorite things about working with rare books is that these books have a potential to connect me with history in ways that extend beyond their written content. 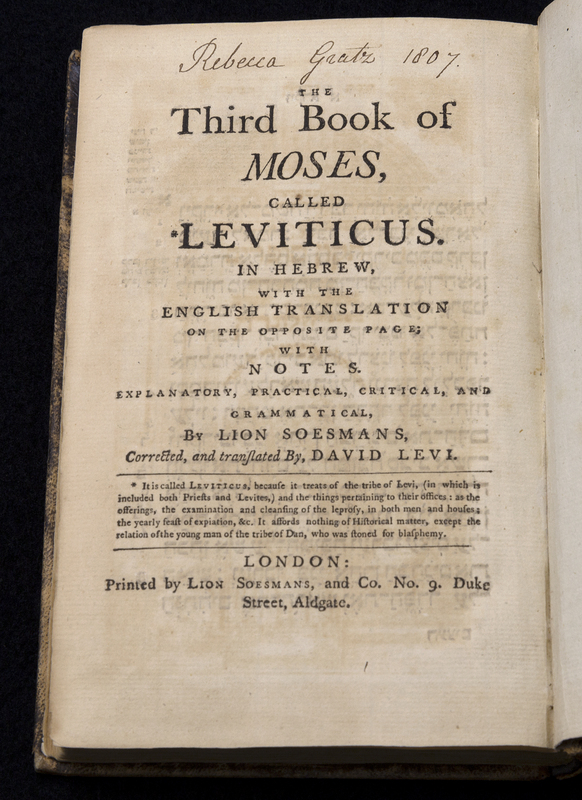 One such example of this potential is the 1786 Book of Leviticus published by Lion Soesmans. What makes the copy now located in the Jacob M. Lowy collection special is that it contains the signature of one of its former owners, Rebecca Gratz (1781–1869). While you may not have heard of Gratz, you quite likely have heard of a far more famous fictional Rebecca: Rebecca of York, the heroine of Walter Scott’s 1819 novel Ivanhoe. A work of historical fiction, this novel helped spur the popular images of Robin Hood, Friar Tuck, King Richard and Prince John. This Rebecca is a dark-haired beauty, a healer, and the central female character of the novel. Desired by men, kidnapped, tried for witchcraft, and ultimately fleeing England, Rebecca of York is an empowering fictional Jewish woman. While the inspiration for Scott’s Rebecca is debated among scholars, many point to Gratz as the origin. As legend has it, Scott heard about Gratz while visiting his friend, writer Washington Irving, at his home in Abbotsford, Scotland, during 1817. Irving was reported to have had great admiration for Gratz, and he imparted these sentiments to Scott. While the fictional Rebecca is no doubt an inspirational character, the real life Rebecca is far more impressive. Born in 1781 in Lancaster, Pennsylvania, her family would move to Philadelphia during her childhood. In Philadelphia her family would become prominent in the Jewish community and in wider society. From a young age, Rebecca would become a leader in philanthropy and community work. At 20, she helped found the Female Association for the Relief of Women and Children in Reduced Circumstances, a non-sectarian charity aiming to help poor families. One of her next major initiatives to help the poor came in 1815 when she helped establish the Philadelphia Orphan Asylum. 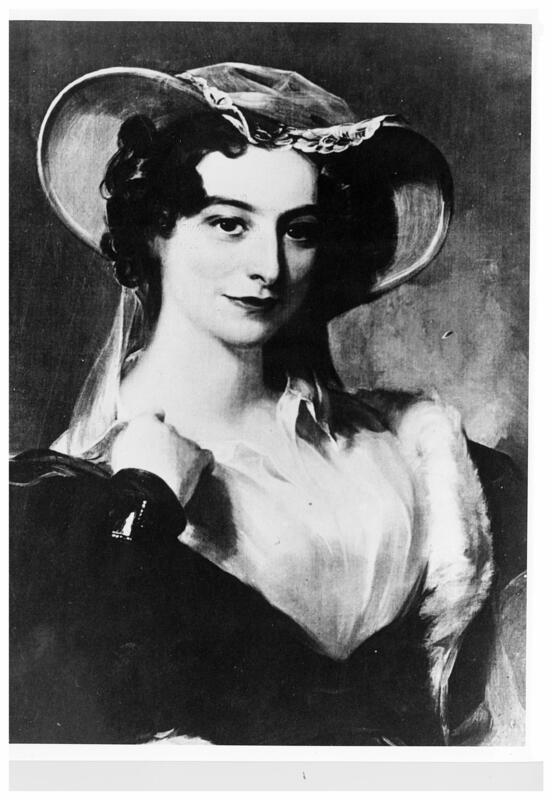 Rebecca Gratz portrait by Thomas Sully. Courtesy of The Jacob Rader Marcus Center of the American Jewish Archives. Gratz was also heavily involved with Jewish charitable organizations. In 1819, she helped organize the Female Hebrew Benevolent Society, which is presently the oldest continuously operating Jewish charitable organization in the United States. The goal of this organization was to provide assistance to Jewish woman in need. This organization functioned independently of any synagogue, but also sought to counter similar work by Christian organizations seeking to convert Jewish woman in need. Her quest to help the poor would continue in 1855, when she helped establish the Jewish Foster Home and Orphan Asylum. This organization would go on to become a model for foster care in the United States. She was also involved with United Hebrew Beneficent Fuel Society and the Hebrew Ladies’ Sewing Society. Arguably, one of Gratz’s biggest accomplishments in the Jewish community was in the area of education. In 1838, she founded the Hebrew Sunday School Society with the sponsorship of the Female Hebrew Benevolent Society. Inspired by the Christian Sunday schools, her school offered a free Jewish education to any Jewish child in Philadelphia. This school also provided one of the first opportunities for Jewish education for female students in the United States. Gratz’s model for Jewish education is still alive and well today in Jewish supplementary schools across Canada and the United States. Perhaps most impressive is that Gratz accomplished all this charitable work while raising her sister Rachel’s orphaned children. Learning about all her accomplishments, it is not hard to understand why Rebecca Gratz has been compared to Mother Teresa. 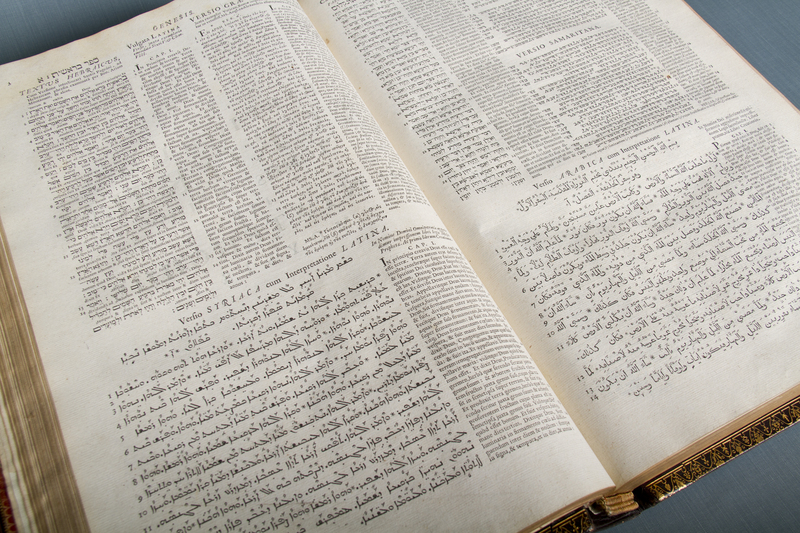 Being able to handle this historic Bible, I am humbled to think of its former owner and her truly remarkable legacy. So far, 2017 has been quite the year in Canada. In addition to countless public conversations, gatherings and events, 2017 has seen many significant legacy projects undertaken to commemorate our country’s sesquicentennial, such as the opening of the Global Centre for Pluralism, or the reopening of the Canadian Science and Technology Museum. Watching the realization of these new legacy projects, it is worth remembering that 2017 is also the fiftieth anniversary of thousands of similar projects from Canada’s centennial year of 1967. 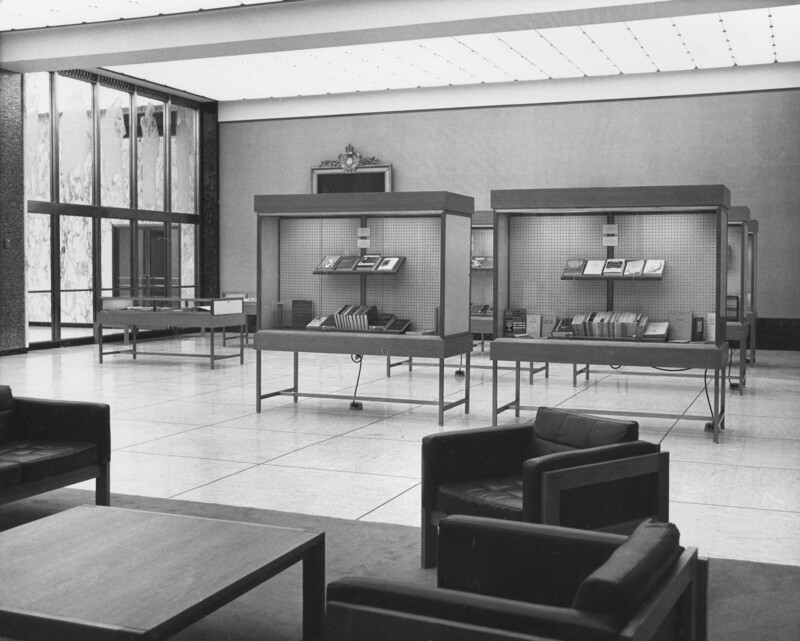 Books from the Canadian Jewish Congress gift on display at the National Library in 1967. Source: Alex Dworkin Canadian Jewish Archives. We, at Library and Archives Canada (LAC), can appreciate first-hand the importance of 1967 legacy projects. Our own building at 395 Wellington Street, along a corridor which includes Parliament and the Supreme Court, was opened in 1967 as a centennial legacy project. We have had the pleasure this year of celebrating this Jubilee and reflecting upon how this space has allowed us to collect, preserve, and tell the story of Canada. While our building was certainly a significant legacy project to Library and Archives Canada, it was not the only legacy project our institution was a part of. As the curator of the Jacob M. Lowy collection of rare Judaica, the centennial legacy project I experience regularly is the Judaica collection gifted to the then National Library by the then Canadian Jewish Congress on behalf of the Canadian Jewish community. A gift I am reminded of constantly as I open reference works I use to see the blue, white, and red bookplate indicating that the volume in my hand was part of the gift. Reading archival documents from the Canadian Jewish Congress, held in the Alex Dworkin Canadian Jewish Archives, it was clear that it was extremely important to the Canadian Jewish community to contribute to the centennial year and give back to Canadians. Dr. W. Kaye Lamb, the first National Librarian, was very appreciative of this gift, feeling it met a long identified need at the National Library, noting that many other national libraries had similar collections. 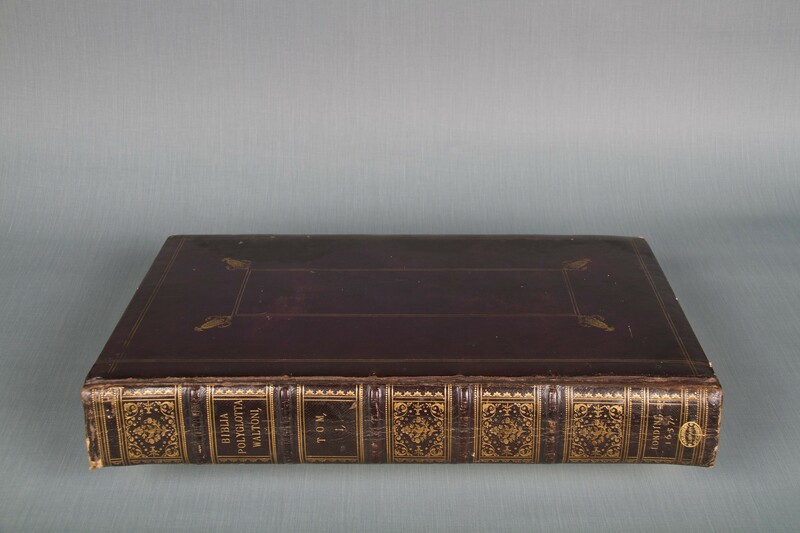 This gift of approximately 7,000 volumes, in a mix of English, French, Yiddish, and Hebrew, encompassed all areas of Jewish scholarship, such as rabbinic literature, Jewish philosophy, Jewish history, Yiddish classics, Hebrew literature, selections representing Jewish contributions to the arts and science, and important encyclopaedias and reference works. Highlights include a general encyclopedia in Yiddish, the Encyclopedia Talmudit, and Cecil Roth’s Jewish Art. All the books were selected, catalogued, and delivered in time for the new building’s opening. To this day, this donation forms the foundation of our Judaica holdings and serves as an important reference tool used constantly by LAC staff and clients. Users can request and consult these and other items from Library and Archives Canada holdings on site in the main building at 395 Wellington Street, Ottawa. While many of the centennial legacy projects focused on physical buildings, it is very appropriate that Canada’s Jewish community chose to dedicate their resources to building the Judaica collection at the National Library. The Jewish people have long been referred to as the people of the book and their history, culture, and religious practices have been inseparable from the written word for thousands of years. Beyond a gift of physical items, this gift allowed for an expansion of the Judaic information and content available to all Canadians and an immeasurable legacy of knowledge. While many of the physical structures built in 1967 will eventually disappear from our country’s landscape, the knowledge that developed as a result of this donation of books has the potential to continue for centuries to come. 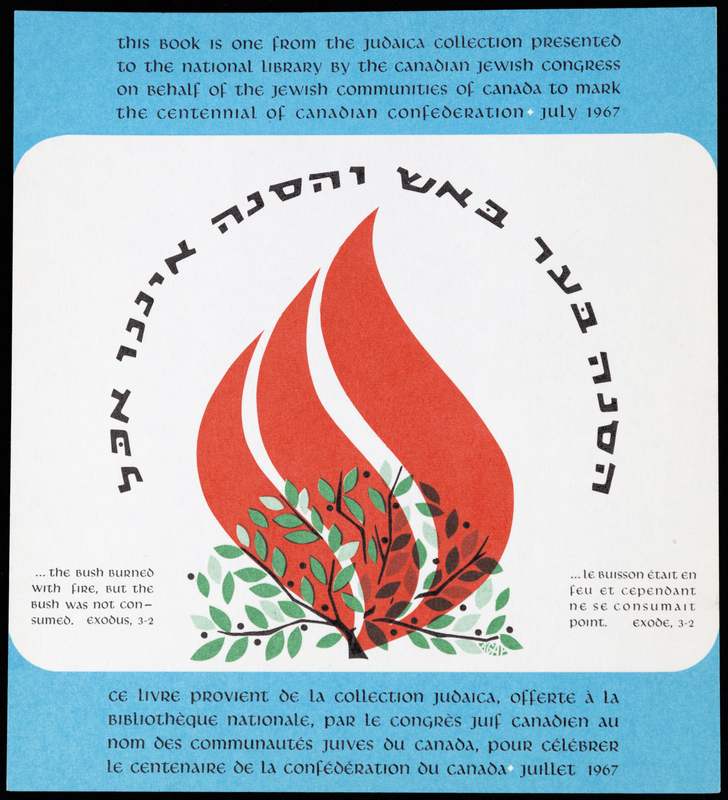 The custom bookplate for the Judaica books donated from the Canadian Jewish Congress to the National Library of Canada to commemorate the centennial of the Canadian confederation. In 1965, at the laying of the corner stone for the new building, Governor General Georges Vanier stated that “…this building will become the repository of the very heart and spirit of our country.” How fitting that in time for the opening of this new building, the Canadian Jewish community was able to deposit in this structure a part of their own heart and spirit, in book form, to be shared with all Canadians. As a librarian, people often question me about the value of the print book in the digital age. After all, many of the books in the collections I serve can be found in digital formats online. While it is true that even the oldest works in Library and Archives Canada’s collections are now accessible in a range of formats online, I maintain that the power of the physical items—and the stories behind them—go far beyond the mere content of the page. One of the items that evokes this sentiment in a powerful way is the fragment of the 1491 Pentateuch, the Jewish canonical scriptures, from Spain. 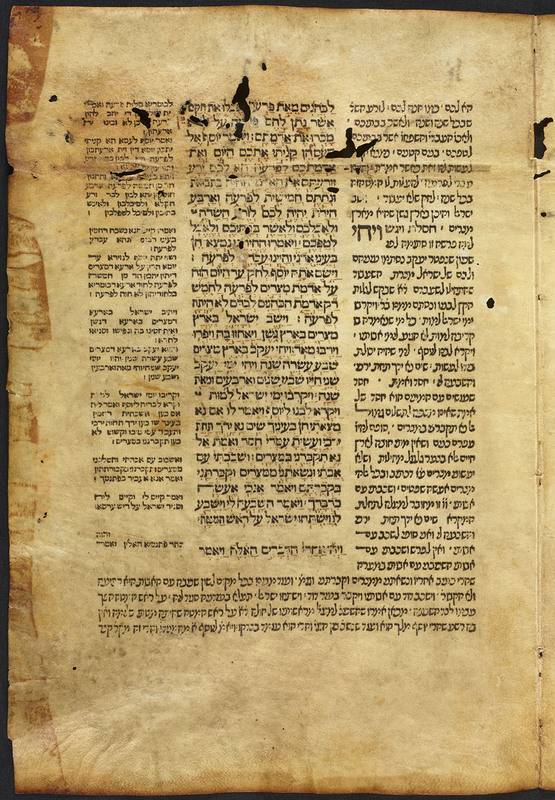 This Bible, printed by Eliezer ibn Alantansi in Hijar, Spain, was the last dated Hebrew book printed in Spain before the Spanish expulsion of the Jews in 1492. While the age, the print quality, or the level of scholarship necessary to produce this book alone make it an important work in early printing, it is the story it tells about the expulsion of Spain’s Jews that makes it a powerful item to behold. Sadly, refugee crises are not new. Currently, our world is in the midst of a global refugee crisis, a crisis we are able to observe almost first-hand due to the rise of social media. The modern world has allowed us to gain an important and humbling glimpse into the struggles of those living in refugee camps. The breadth of media content, blogs, pictures and personal accounts will allow future generations of scholars to understand the struggles of contemporary refugees in a way previous generations of scholars could never have imagined. But what about past refugees—how do we try to understand the struggles of medieval refugees, their expectations, their former lives, their hopes for the future, and the devastation caused by their upheavals? These questions represent a tremendous challenge for historians who wish to uncover the experiences of those in the past. History needs to be more than dates and the stories of the elites; the stories of the masses and the collective experiences we need to learn from are the important episodes that should be investigated. This is where I return to the biblical fragment found in the Lowy collection. From a content-on-the-page perspective, does the Pentateuch represent anything more than a standard Rabbinic Bible, the type that could be downloaded for free? The simple answer is no. Looking outside the text, does this item provide insights into the lives of Spanish Jewry on the eve of expulsion? I believe the answer is a resounding yes. I look at this page and see a community that saw itself as stable and with a future in Spain. 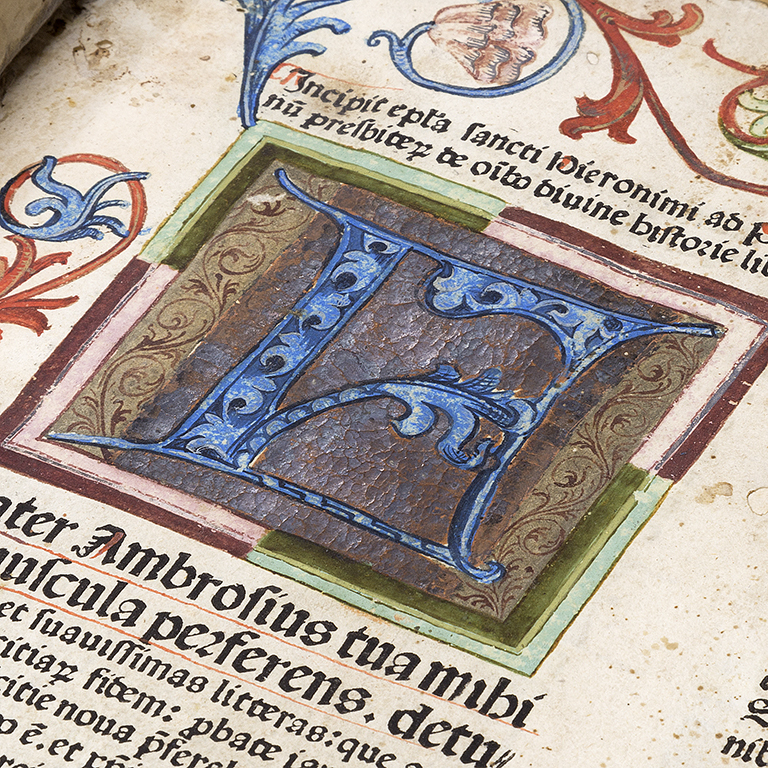 In the early days of printing, a Bible like this would have been a major undertaking. The establishment of communal infrastructure in the form of a printing press, the investment in scholarship, and a major economic undertaking are, to me, evidence that Spain’s Jews saw themselves as secure and with a long and stable future in the Iberian Peninsula. I look at this page and see people who did not imagine the major upheaval and communal devastation that was less than two years away. In short, I see firsthand evidence of one of Medieval Europe’s largest refugee experiences. As a librarian and curator, I strongly believe in the power of the physical book, a power that goes far beyond the content of the work. While e-books and websites ensure global access to a range of intellectual content, the humbling experience and historic evidence offered by the physical book are irreplaceable. One of the most common questions I am asked as the curator of the Jacob M. Lowy collection is “which is your favourite book in the collection?” While I am unsure if I will ever be able to pick one, there is a work in the collection which I often highlight. Visitors are not surprised when I mention it is one of our Talmuds, the written compendium of Jewish oral law codified in antiquity and arguably the most important Jewish text after the Torah, after all we have impressive volumes from Soncino from the 1400s and Bomberg from the 1500s. I often get a surprised look when instead of selecting a 500 year old volume, I pick a volume that is not even 100 years old. 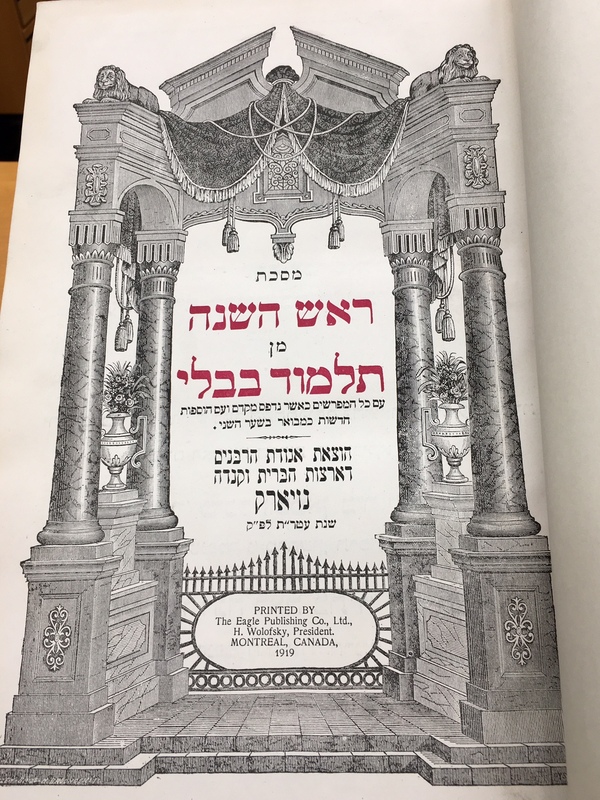 The item, and one of my favourite works in the collection, is the 1919 Montreal Talmud, which’s publication was termed “the most important event in the annals of Canadian Jewry,” by Canadian Jewish Congress president Lyon Cohen. To truly appreciate my admiration for this printing of the Talmud, one needs to understand Canadian Jewish history. While some Jews did arrive in Canada during the 1700s, large scale Jewish immigration to Canada did not begin until 1880s. In the early 1900s, the majority of Canadian Jews were actually born in Eastern Europe. Frontispiece of the 1919 Montreal Talmud in the Jacob M. Lowy Room at Library and Archives Canada. 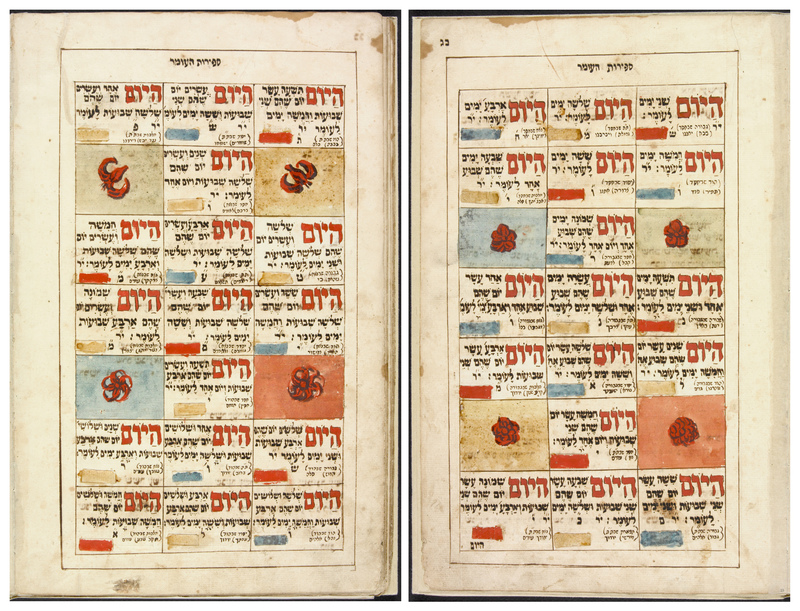 The Altona Haggadah, a colourful handwritten and hand-illuminated manuscript on paper, created in 1763, is one of the treasures of the Jacob M. Lowy Collection at Library and Archives Canada (LAC). The Haggadah, which means “telling” in Hebrew, is an important text in the Jewish tradition that is used during the Passover Seder, a ceremonial meal held in Jewish homes to commemorate the Israelites’ liberation from Egypt. It is a compilation of biblical passages, prayers, hymns and rabbinic literature. 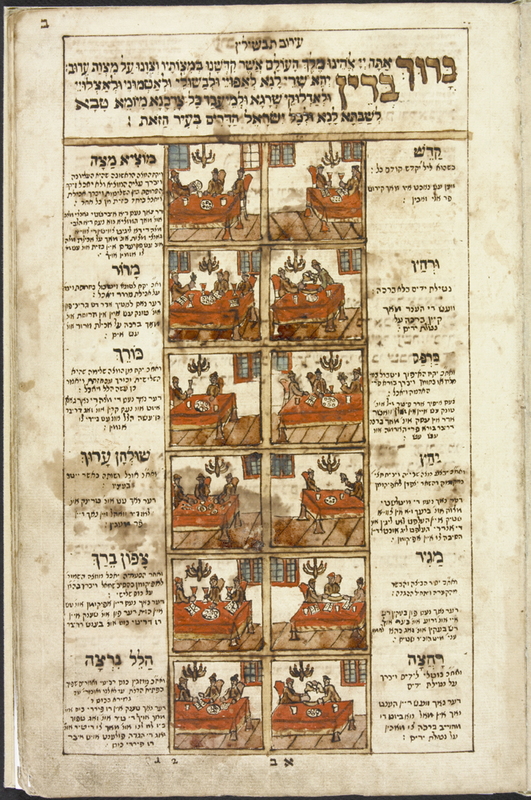 You can also find incunabula (books printed before 1500), Bibles, ancient Jewish manuscripts and about 80 other Haggadot (plural of Haggadah) in LAC’s collection. Although Brian Walton sounds like a guy you could google or find on LinkedIn, one glance at his likeness in the 1657 Polyglot Bible, resplendent in bishop’s robes, quill in hand, will quickly disabuse you of that notion. Walton, indeed, was a product of the 17th century and left a legacy in the form of the magnificent multilingual Bible comprised of original tongues and early translations. Two versions of the bible were printed, the earlier one is known as the “Republican” version which thanks Cromwell in the dedication for removing the import tax on paper. The latter one is known as the “Loyal” version as it was printed after the Restoration of the Monarchy. Library and Archives Canada (LAC) has the privilege of owning both versions. These bibles are just some of the treasures available in the Jacob Lowy Room at 395 Wellington Street for scholars and the general public due to the foresight of Mr. Lowy and LAC. If not for the Polyglot that bears his name, Walton’s face and backstory might not have made it to the 21st century, as his grave was destroyed in the Great Fire of London. An active and controversial clerical figure in the 1600s, he disagreed with some of his puritan parishioners and a House of Commons committee over the issue of tithes. Forced into early retirement in Oxford, he used the opportunity of enforced leisure to brush up on a few ancient languages, conceive a plan to create a polyglot Bible, sell the idea to eminent scholars of the day, and enlist the services of his colleagues who specialized in Eastern learning. 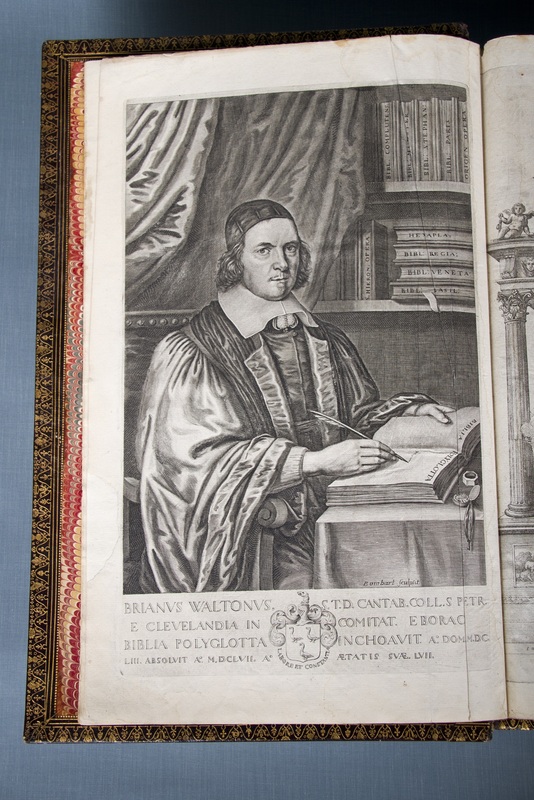 Engraving of Brian Walton in the introduction to the 1657 Polyglot Bible. At least three polyglot Bibles had appeared in Europe in the 1600s but Walton was interested in creating a less costly, more saleable version. It was a successful commercial venture, even though Walton had priced it at £50. It often was the most expensive book on the shelves of scholars and gentlemen. This was the first work to be sold in England by subscription. By the time the work was ready for press, over £9,000 had been collected. It also represented a technological triumph of the day, being the first Bible to print all versions side by side on the same page. That is just one of the incredible features of this six-volume set that gives new meaning to the word “tome.” Seeing the ancient biblical text appearing in nine languages, including Hebrew, Greek, Syriac, Arabic, Ethiopic, and Persian on one page, with Latin translations of each language, makes you wish you had taken more languages at school. 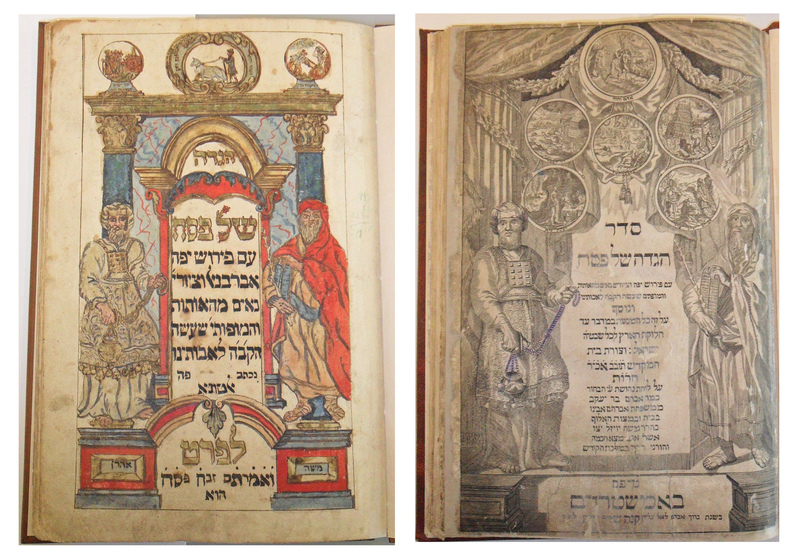 The Walton Polyglot is a unique work with a unique story to tell, not only through its content but also through its more than 400-year journey from London into the Montreal home of Jacob Lowy who donated his entire world-class library of rare and old Hebraica to LAC in 1977. For more information about the Lowy Collection, please visit http://www.collectionscanada.gc.ca/lowy-collection/index-e.html.